This tropical vacation in a glass is a must-try any time of the year! To make the cold brewed tea for this recipe which is 2 servings, use a thoroughly cleaned small-size glass container with a lid and fill it with 1 cup of cold water, add 2 regular size black tea bags (with the strings hanging over the top edge of the container), cover it with a lid and put it in the refrigerator overnight for at least 6 hours. After its brewed, remove and discard the tea bags from the container and store the tea covered with a lid in the refrigerator for not more than a day for the best flavor and freshness. 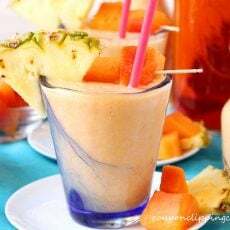 In a blender, add the Mexican papaya chunks, pineapple chunks, cold brewed tea, yogurt and ice. Blend on the smoothie setting. Give the smoothie a taste test and add honey if needed. Serve right away while ice cold. Garnish each serving with a slice of pineapple and chunks of papaya.